A big welcome Spring or Autumn depending on your location! Extreme temperatures have us either trying to keep cool or warm. I love Spring and Autumn because you aren't greatly affected by the temperature and energy abounds. Cleaning and organizing your wardrobe and fabric stash is a must for the beginning of a season. Wardrobes are like filing cabinets..sometimes we put items in the wrong file and discover them when we are Spring Cleaning! Discovering orphans in your wardrobe is wonderful! I found five items while organizing my wardrobe for Spring/Summer a few weeks ago, that I must admit were off the radar and were not being worn. As my Colour palate is Warm and Toasted (Spicy) most of the clothes in my Current wardrobe can be worn together. A little bit of time and the creative juices produced some interesting outfits. 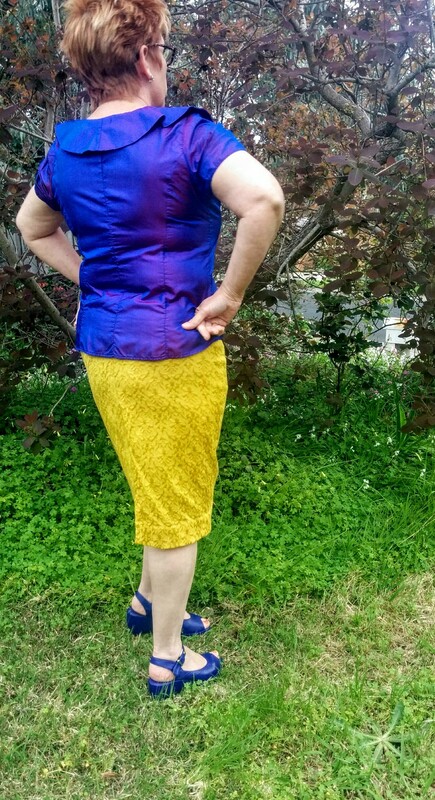 Purple is not normally my go-to color but with this yellow pull on skirt I will wear this on the right occasion. These purple shoes have been in this wardrobe for a while. Glad to see them earning their keep. This top is a bit too puffy and pleated in the front. Not really flattering but with a stretch bengaline skirt that used to be white I am in love with this top/skirt combination. I love to dye my clothes when I want to add excitement to my wardrobe too! Lastly Fabric also needs to be looked at. How many times have we discovered an old love that has been hiding in the stash. I recommend you to continue the spring clean and rediscover some long lost love. I would love to know what you found and what you put together!